Three blue men make music and play with color and light in this family friendly show. 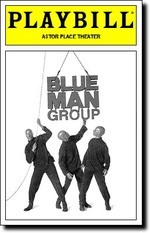 Blue Man Group is a live show where three men with blue faces experiment with art and music. They like splashing paint around and hitting things. The show is definitely aimed at a juvenile audience, but I still found it mildly entertaining. It is similar to Stomp, with a more kid-friendly and artsy feel. The show was quite loud at points, and strobe lights were used. At the end of the show, the audience helps unroll lots of large toilet paper rolls. As silly as it sounds, it was probably one of the more fun parts of the show. There's a reason this show has been playing in NYC for over 20 years and can now be seen in many of the world's capitals. It may not be profound, but it's highly creative and a whole lot of fun. Most of the comedy is visual and musical, so you don't need to speak English to have a great time. Very enjoyable. Especially if you understand what is happening. They are three... one really as you watch and notice they all react at once.... that try to recapture that child like fascination with things ... that we all once had.